A chess game with 32 intelligent pieces? Chess is a game designed for two players. All the experiments with ever more advanced computers playing either against humans or each other naturally conform to this assumption. But what if the game were changed so that each piece were artificially intelligent (AI), made its own moves, and the decision about which piece on a side were to move next were negotiated among the pieces on that side? What could this tell us about ways we can use distributed AI (DAI) or develop a complex swarm intelligence (SI), and whether and how the “wisdom of crowds” dynamic might apply to groups or teams of AI processes. The idea presently ventured is not a computerized version of the “Wizard’s chess” in the Harry Potter books and movies, since like real chess, that is two-player game. The only similarity might be that each piece would indeed have its own opinion about its next move. It might be a bit more like a virtual chess version of the sci-fi drama Westworld, in that pieces interact (although not with people) and learn. In any event, the immediate inspiration for this line of thinking actually was sparked by an image (right) of a couple of robot figures on a chessboard* at the just concluded Future Fest 2018 conference in London. While being quite aware of the advantage of a single mind or computer directing a side in chess, I’ve also become interested (as a non-expert in the field) in how intelligent agents with different though perhaps complementary goals, might interact in a defined environment towards a particular goal. Since so much work has been done with computer/AI chess in the standard 2-player mode, I wondered what might be possible with AI on the level of all the 32 individual pieces on a virtual chessboard. Another design parameter involves a choice: Either each piece would know no more than the above, or would be given data on how it has (been) moved throughout many actual games. 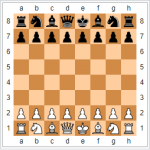 In the latter case, it would have a repertoire of possible moves in various situations to choose (or depart) from, but not a generalized overview of the games. The communication among pieces on a side prior to a move would be a critical aspect, of course. For the opening move on each side, there are only 10 of the 16 pieces that can move, and each has exactly two (2) choices, for a total of 20 potential moves. Beyond that, the numbers and combinations – and hence complexity – increase significantly. There have been experiments where AI bots have interacted, but this 16 sided interaction would be significantly more complex. With each piece being able to consider its own possible moves plus not moving on each turn – even given a specific arrangement on the board after each previous move – there is no one obvious decision for the side from the point of view of the individual pieces (except where a piece wants to escape being taken, or if the king is threatened). Unless instructed in the set-up how to arrive at a decision, the pieces would have to develop their own criteria or method for choosing which piece on the side will make the next move. Some protocol for communication would likely be necessary, especially to facilitate human study of the decision process. If we treat the AI chess pieces as learning programs (like AlphaZero and Leela Chess Zero), then each piece would probably best always be in the same position – such as e2 white pawn or b8 black knight. That would simplify reference to past games if we choose to give pieces that data, and would in any case presumably facilitate learning the role of the piece over many games. One could also try various experiments such as switching the position of a piece (that e2 white pawn to, say, h2), or putting a veteran piece on a rookie team to study how it affects the team function. It would be interesting to evaluate how much computing power is needed for each AI piece and whether/how much that varies by type of piece or position. And naturally also what the aggregate of those demands are per side. As with AI in the 2-player game, one would watch for unexpected outcomes in the 32-player (but still 2-side) game. Would for instance pieces develop the willingness to sacrifice themselves in scenarios that might lead to their side winning? * Drikybot, the creation of Audrick Fausta, dancer and engineer in mechatronics. Image was copied from Twitter. The caption on the tweet that triggered my thinking on this was something like “what are their thoughts?” – unfortunately I was unable to retrieve that specific tweet for this post. In a sense, the job market is really a market in resumes, even though a real person – someone seeking a job, a potential employee – is behind each one. Resumes stock databases, they are digitally searched, they may be passed around and printed and looked over. The distribution of resumes engages intermediary organizations, and advice about how to write and share resumes has become an economic activity. And of course, each resume itself represents an investment of time and resources. The resume, as a statement of one’s experience and education, and nowadays often cast as a marketing tool, is perhaps the central element in the current employment system. While some want to trace the history of the resume back to Leonardo da Vinci (see the diagram at right1), it really only became an established part of job applications well into the industrial age. 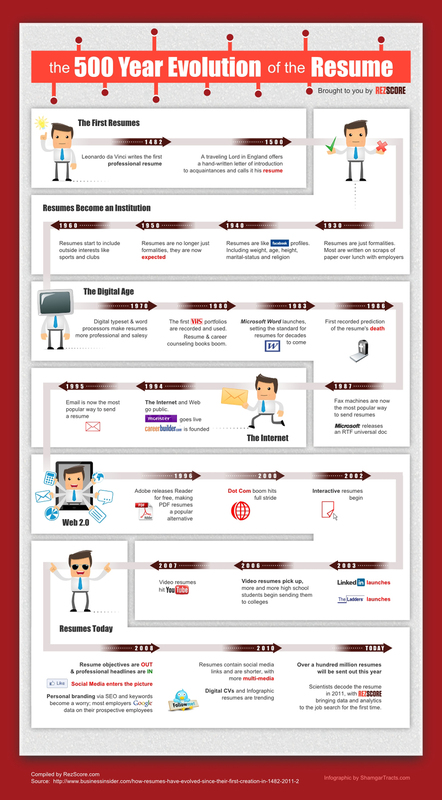 Despite some changes in standard content over the years (e.g., bio info no longer appropriate, the objective statement now “out of style“), and in availability of much better tools for producing and disseminating resumes on the one hand and processing them on the other, the basic concept hasn’t changed at all. The ability to submit resumes has always run into the problem of whether and how they will be read on the receiving end. I still recall a talk back in the late 1970s in which the speaker suggested a red ribbon as a device to make a resume stand out in the very physical pile of paper before a recruiter hiring for entry level positions. Current availability of advice and tools to improve the content and look of a resume are more sophisticated, but still reflect the same concerns. In place of artifices like a red ribbon, job seekers of all levels these days are advised (1) to layer keywords into their resume or CV (one site lists 155) in order to make them findable in the digital pile, and (2) on the chance the resume is seen by human eyes, to format the content for the few fleeting seconds of attention they may get. For more detail, read the 300-page manual on resume writing offered by The Ladders. Another factor is the disparity between those fleeting seconds of attention, and the hours spent putting together, updating, and tailoring a resume. It naturally takes much longer to write something worthwhile than it does to read it, but it seems that resumes are no longer even read. One quick estimate is that time spent glancing over a resume may be only 0.0003% to 0.0014% of the time taken to prepare it. Meanwhile, the same digital technologies that have facilitated producing and editing resumes on the one hand, and online job listings on the other, have fostered a kind of trade in resumes. It is possible to post a resume on a website where, if one is to believe the advertising, it will be “exposed” to hundreds of thousands of employers. ResumeRabbit.com, for instance, claims over 1.5 million (via reposting to 89 other sites). It will however be one of probably millions vying for attention. Even on a more specialized level, the numbers are incredible: DevelopmentAid.org for example, offers a “CV broadcast” service reaching 30,205 organizations (as of April 2017 – the number varies). In short, the system is flooded with ever more resumes. One could argue that the humble resume is in effect being asked to do much more than it was ever intended to do. No surprise therefore to see radical-sounding prognoses such as the “death” of the resume (for example in 2013, the previously cited 2015 list, and of course Nelson Wang’s 2012 book, The Resume is Dead), perhaps along with its recent counterpart, the applicant tracking system (ATS) . In fact, the resume was never “alive” to begin with, given that it is static information on a page(s). Social media presence may be more current, and other resume-surrogates may have their appeal (some of them are quite creative in what they can convey), but in the end, these are all passive presentations of information, regardless of how well-crafted they may be. Hence one of the questions here: Could artificial intelligence (AI) bring the resume to life, able to interact with a human or machine reader, bring forth relevant information, learn from the interaction, and inform the owner of the resume? There is arguably an inherent dysfunctionality to this system, of which resumes are central, as the volume of applicants and positions grows. In the massifying job market, more people can send applications – relatively more easily thanks to technology – to more organizations for more positions. So, hiring departments adapt with more automated ways to screen out digital documents and reduced time for eyes-on review. But even if job seekers “load” their resumes with keywords to get through the automated screening, the software is also “raising the bar,” to screen in more sophisticated ways. An extreme outcome of this “keyword arms race” is the oft-cited case where one company screened 29,000 applications for a single engineering position with not one of them found qualified. Suggestions per Nelson Wang and others that job seekers take unorthodox strategies – the new “red ribbon” – are only an advantage when a few are using them. How much does anyone stand out if everyone is standing out, and how can recruiters with limited time sort through the cacophony? There are human limits. Hence on the recruiter side, automation and discussion of “AI” to deal with applicant data – which in turn reduce the applicant, or actually their resume, to data. This massification of the job market is exactly the kind of situation – large and increasing number of actors, large but varying numbers and types of openings, complex quantitative and qualitative data, and waste – where a more intelligent, if not interactive, program or automation could do much better for everyone. As one moves up the scale to more specialized and executive positions that are relatively fewer in number and higher in pay, the dynamic changes in some respects. Recruiters, sometimes from executive search services (headhunters) or firms specializing in particular professional fields, may reach out to contact prospective hires. Personal contacts developed in earlier work, may prove useful as sources for information and/or references – and indeed important as many positions on higher levels are not advertised (this is another issue that I’ll come back to). But there are still many people chasing mid to higher level positions in the same job market, relying on basically the same methods and advice. The job market is one of imperfect information – in several ways. A job seeker can’t know all available positions they qualify for, and even the best research on a potential employer goes only so far. Recruiters must judge candidates based only on resumes first (usually) and whatever other information comes in the application or via referrals, and they often – especially in some industries – are dealing with a subset of potential candidates they’ll never have the chance to consider. All of the above (except for job agencies run by government or non-profits) are businesses, basically selling services to employers, job seekers, or sometimes both. Like any business, they seek to maximize income, minimize expenses, and provide services that attract (and in some cases, retain) customers. Significant amounts of money and attention to diverse revenue streams (often from both recruiters and job seekers) are involved. On the job seeker side, for instance, resume writing services run about $100, while job coaches cost clients hundreds or thousands of dollars, with one upper end service costing about $10k (and all of that without any guarantee of results). No figures on what recruiters pay for services in this subsector (in tandem with their in-house recruitment capabilities), but it likely is a lot. So, we have a system that has grown in all respects, has costly inefficiencies, and is – along with all of us – in the midst of technological change including what we call AI. It is inevitable that some aspects of AI will be brought into the job market more fully, even as other aspects of AI are applied to automate various jobs. We already see the early stages of this, as mentioned in the previous post in this series. The next post will focus on AI, with particular attention to the less often considered subject of what it might do for the job search side of the system, and how it could change interaction between job seekers and recruiters. 2. Since traditional resume-based approaches on the entry level may miss talent, some employers try to get away from the resume, even using social events or computer games to evaluate applicants. It is not entirely new to have such live-performance evaluations of candidates – the US Department of State has long used an observed role-playing exercise as part of the selection process for Foreign Service Officers. There’s lots of speculation these days about how robots and artificial intelligence (AI)* might further transform the way we work or drive a new industrial age – along the way maybe even taking our jobs – but not so much on how such advanced technology could change the ways recruiters fill positions and almost nothing how it might help people find employment. In an age where self-driving cars are already on the road, aren’t we due for some breakthroughs in the mechanisms recruiters and job hunters use in the job market? Maybe you’ve read about the novella “co-written” by AI that fared well in recent a Japanese literature competition? Or other projects using AI to write reports or stories – or even “better emails“? If I’m writing a resume, I’d want something along these lines to fill in all the right details and keywords to the right measure, and optimize it just right for the recruiter’s database search and eventual 6 or 8 (or maybe 30 on a slow day) seconds of attention. But wait – if I’m a recruiter I might want something along the lines of that Alphago program that beat human champions at the complex game of “go” to analyze candidates’ skills and track record and figure out which ones fit best in which positions, seeing ahead a few moves to future development and retention. So maybe even award-winning resumes won’t be seen by humans? But then, since we’re talking about AI, maybe the resume writing program and and the recruitment strategy program could somehow just talk to each other? Have them get back to us when they have something! It’s hard not to speculate about what AI might be able to do to make both the job search and the recruitment process less labor intensive, more efficient, and more productive for all. In recent years there has been a lot of discussion of how technology trends will affect job hunting and recruitment – for example 6 or 7 ways in 2012, 5 ways in 2013, reiterated in 2014, 10 more in 2014, 4 or 5 or 10 ways in 2015. However, all of these really concern changes in, not of, the system, and don’t venture into how cutting edge technology could transform the job market. Yet. AI actually does come up in a few discussions of technology for recruitment – for example as early as 2008 and in a later undated article – but more as sophisticated ways of searching resume databases and beyond. A recent article tacks on chat bots and employee onboarding to the tasks AI might do for recruiters, so you can see the direction things are moving in. There’s not even that much for job seekers, who are for the moment still stuck essentially with late 20th century tools and processes. A recent innovation for job boards claims to use AI to help job hunters find positions. Again an intimation of where things might go, but again not changing the search process, let alone the vehicles used to apply – such as hand-typed resumes. A system on the verge of transformation? Could we be on the cusp of a revolution in the job market involving AI, data science, and perhaps virtual reality that could aid both the person looking for employment and the company doing hiring? One that would enable a lot of the time-consuming processes involved in searching and application on the one hand, and review and screening on the other to be done more quickly and systematically, with less human error, and on a wider scale than is possible with current methods? This is not to suggest that the whole hiring process should or could be completed without human input, but rather that many of the initial (often repetitive) tasks on both sides could be more efficiently and productively handled by intelligent automation – processes that ultimately will be able to interact. And that that human input would then come in where it is most valuable, and indeed essential: input of information and parameters at the outset, and at key decision points later on. 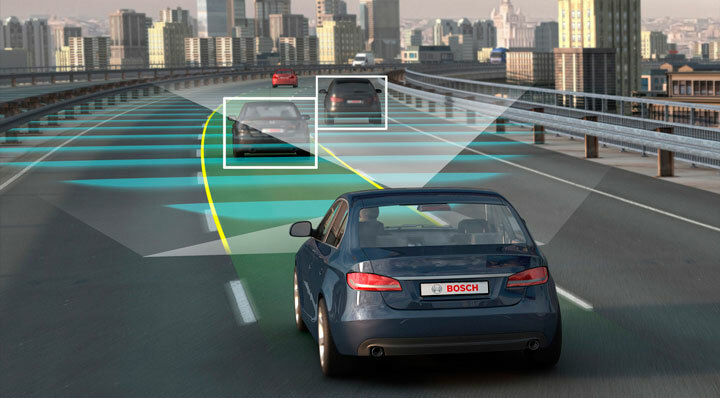 If self-driving cars can provide personal transportation that is potentially safer and more efficient, couldn’t there be analogous advances in how jobs are found and filled? On the job seeker side, consider how much time goes into searching listings, filling out applications, crafting resumes, writing cover letters, and maintaining a professional social media presence. And along the way keeping up with all the advice and evolving thinking on approaches and techniques to do all of that better, which has become an industry in itself (looking for a job? here’s a list of 9 more books you should read, according to Business Insider). Altogether this represents a lot of repetitive work, most of which has no return (one recent article on “1200 job rejections” illustrates the problem). What if much of this could be automated, intelligently? Could AI, informed and tasked by a person, search out particular kinds of openings (roles, companies, locations), write and tailor presentation of professional information, and generate job applications? As a learning (recursive) program it would be designed to adapt, but a key aspect would have to be iteration and course correction with the person it is representing. On the recruiter side, consider how many applications are received for each position, with the numbers growing each year. Incoming applications have to be processed in limited time, or stored in an applicant tracking system (ATS) and accessed as data (think keyword searches of masses of resumes). And then there’s screening and checking references. What if incoming applications could be analyzed and queried, with preliminary background and reference checks as appropriate, to yield a short list? What if the ATS was smart enough to do all that? Then there is the question of how AI in the service of job seekers and AI in the service of recruiters would work together. One would imagine the need for a system of protocols and a conceptualization of the virtual space in which they would interact, as intelligent agents (IAs) in a multi-agent system. That could in turn lead to radical changes not only in how jobs are found and filled – for one thing, IAs operating quickly and across cyberspace could find matches that people could not – but perhaps also in the ways careers and staffing are approached. One could be permanently on the market in the sense that the IA could regularly check new employment opportunities or potential new hires. And perhaps lead also to novel outcomes as IAs go to work: What if for example, IAs of job seekers who have never met could compare notes about an organization or salary offers, or IAs of recruiters could share data on a particular candidate? The idea of technology fundamentally changing the ways people find employment and organizations find employees – as opposed to enhancing or modifying parts of the current system – is not new. 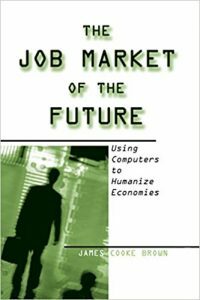 Perhaps the most extensive effort to think through the possibilities is that of James Cooke Brown in his 2001 book, The Job Market of the Future: Using Computers to Humanize Economies. But while Dr. Brown’s work considers how to reorder the economy and thus the nature of employment, aided by computer technology, I’m wondering if the sequence will actually be reversed. That is, that application of advanced information technologies – specifically AI – in the service of individual employers and especially individual potential employees might in turn change the nature of those relationships and how careers are built. The job market as we know it is basically an evolution of communication between people needing paid work and people needing help with getting something done. 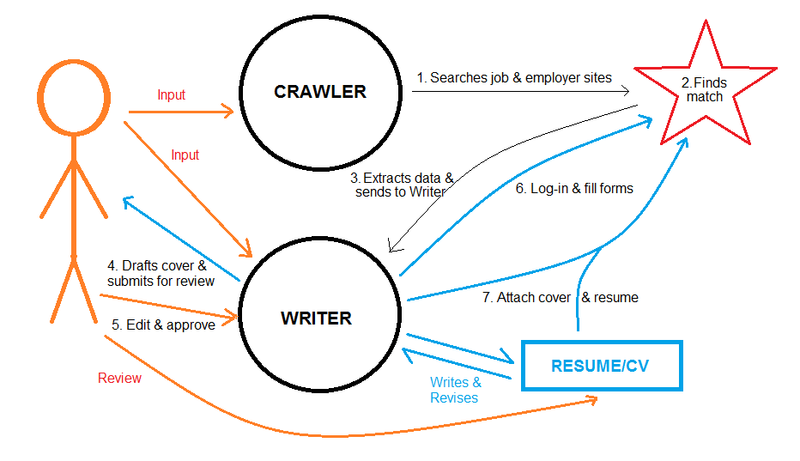 And the current system of web-based applications and screening of digital resumes is the contemporary version of a set of tools, roles, and modes of communication developed in recent history as economies became more complex: job ads; employment agencies and websites; applications with resumes and cover letters; recruitment/hiring as a specialization within the field of human resource management; and processes of review and selection. * AI can refer to a range of capabilities and processes. For a basic introduction, see the articles in Encyclopaedia Britannica and/or Wikipedia. In referring to AI in this blog post, I am assuming some variable sub-set of that range.